The Norway Institute for Public Health, or Folkehelseinstituttet has announced a mumps outbreak, primarily among university students. 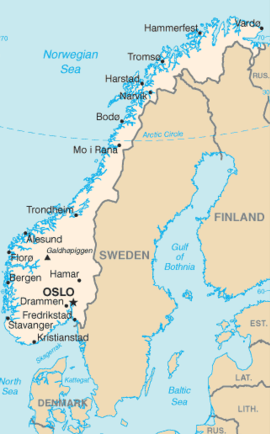 The first reported cases were in the Trondheim area–the Norwegian technical and University of Science and Technology (NTNU) and the University College of Sør-Trøndelag (HIST) in late October. Now the case count hovers around 80 and health officials expect the cases to increase in coming weeks. Several of those who are now sick with mumps are Norwegian students who have previously received two doses of MMR vaccine is recommended. It is possible to get sick with mumps even if you have been fully vaccinated against the disease, confirming Margrethe Greve-Isdahl, chief physician at the Department of vaccine, Public Health (FHI). In Norway, the vaccine against mumps in the MMR vaccine (measles, mumps and rubella) offered in the childhood immunization. First dose offered to children at 15 months of age and second dose at 11 years of age (6th grade). FHI generally recommend that all who have not received two doses of MMR vaccine are eligible for this. This also applies to students who come to Norway. Upon initial vaccination is recommended that at least three months between doses, but there is a benefit to the immune response if it goes longer. MMR vaccine (measles, mumps and rubella) is free to all and dispensed from FHI. The virus is spread from person to person by coughing and sneezing and by direct contact with saliva and discharges from the nose and throat of infected individuals. Mumps is contagious three days prior to and four days after the onset of symptoms. Symptoms of mumps usually appear 14 days to 18 days of infection. They usually include fever, headache, and swelling and tenderness of one or more of the salivary glands, usually the parotid gland (located just below the front of the ear at the angle of the jaw). In mild cases the swelling may only last for three days to four days, but it may go on even up to a week or more. Approximately one-third of infected people do not exhibit symptoms. There is no specific treatment for mumps. Most complications that may arise involve other organs. Mumps can cause pain and swelling of the testicles, deafness and arthritis. It can cause central nervous system disorders such as encephalitis (inflammation of the brain) and meningitis (inflammation of the covering of the brain and spinal column). that is because vaccines dont work..ever..the injection of aluminum..and mercury and all the other crap..is not worth it in the long run.